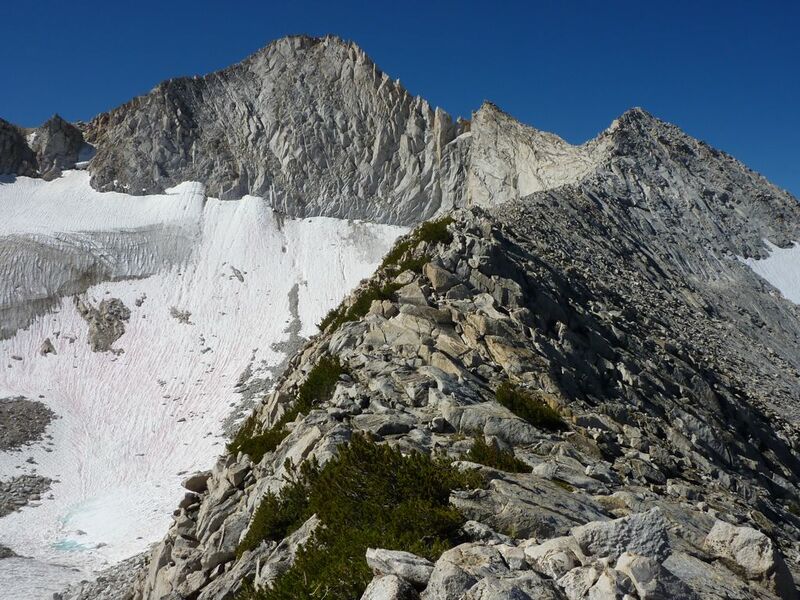 Conness is an inspiring peak, and the north ridge to west ridge link-up is a Sierra classic. It is also a good and popular solo: since the crux of each route is at the beginning, while most of the rest is 4th to easy 5th, you are unlikely to have to back down far if the route proves too difficult. I was intimidated by the north ridge’s 5.6 downclimb crux, but the pitch proved much easier than its grade, and I had one of my best climbing days since the Tetons. It was a perfect route for me at this point, challenging but not frightening. I woke up at 5:30 near Saddlebag Lake, but it was awfully cold, so I slept on until 6:30. There was still frost on my windshield — both inside and out — so I drove up to the trailhead, then wrote yesterday’s post while waiting for the sun. I was intimidated enough by the route to bring my rock shoes, but not enough to bring a rope; if the downclimb on the north ridge proved too difficult, I would just give up and come back when I was a better climber. I took my time on the approach, meandering along Saddlebag Lake before climbing past Greenrock Lake and the Conness Lakes, where I got my first view of Conness and its glacier. The use trail comes and goes, and I followed it where I could. Partway up the sand-slope to the Conness-North saddle, I found a ptarmigan and her teenage chicks on the trail. Mindful of my previous experience, I gave her a wide berth, but she did not seem inclined to violence. From the saddle you can clearly see the whole route (though you stay on the west side of the ridge), including both towers. On the way to the first tower, I passed two older women simul-climbing the fast 3rd class terrain. It seemed pretty pointless, since the route was not that exposed, a fall by either would still hurt a lot, and dealing with the protection and rope slowed them down a lot; to each her own, I suppose. Other than a couple of long moves to the left, the first tower was easy, and I was soon on my way up the second, following a dirt-and-rock ledge on the left, then returning to the crest near the end. Despite what I had read, none of the climbing was harder than 3rd or easy 4th to this point. I wasted some time circling around the right side of the second tower, before returning to the first rap station. I had expected something gnarly and vertical, but instead there were some big, easy 5th class blocks to the left leading down to a notch. Below the notch, I tried some diagonal cracks along the ridge, then retreated, downclimbed a short chimney, and crossed to the main summit pinnacle on some lower cracks. The climbing from this point was all 4th or easy 5th until some blocks with short, unpleasant-looking chimneys between them. After exploring the chimneys and the surrounding rock, I spied a narrow ledge on the precipitous left side of the ridge and remembered a photo I had seen on SummitPost; I backtracked a bit, and got around the difficulty on the easy, improbable, airy ledge. From there it was straightforward climbing to the summit, which I had to myself. I started down the class 2 route, then turned south and looked down the chutes to the west for a way to the base of the west ridge. After venturing down one that cliffed out, I found the obvious correct one, and soon reached the base of the west ridge passing the impressive southwest face. The first pitches looked tough enough that I stopped to put on my rock shoes. I enjoyed the increased precision and grip, but my feet, swollen from half a day’s hiking, were crushed and uncomfortable. The crux was consistently hard but fun, with ample cracks, flakes, and knobs. As soon as I popped out on the edge of the southwest face, I stopped for a few minutes to put on my trail runners, then promptly slipped on a harmless slab; sticky rubber really does make a difference. The climb from here was mostly a long cruise, either along the ridge or in a gully to its left. Surprisingly, the ridge itself may have been easier, with a sharp edge perfect for hand-traversing. I probably could have moved faster with rock shoes, but it would not have been worth the foot pain. This time, I reached the summit to find three unfamiliar people. One thought he had done the north ridge to west ridge link-up, but he was confused, and had in fact climbed the east ridge first. He said it was unpleasant, so after talking with some other people on the summit, I headed down the tourist route to Sawmill Campground. I found another patchy use trail, which eventually turned into a road near the campground. The campground is unfortunately several hundred feet below the lake, so I had a grinding uphill shortcut to my car. Still, with two awesome ridges in under 9 hours it was a good day. Glacial lake with film of ice. Second tower with supposed 5.6 downclimb. Looking back from high on the N ridge. Airy, sneaky traverse near the summit. Banner and Ritter (l) and Lyell and Maclure (r) from summit. Steps on the tourist route. West ridge from above the crux. Summit plateau, southwest of summit. Summit block from summit plateau.